Teenagers will have a blast learning principles of engineering as they build this mechanical marble machine. Engineering has never been so rad. 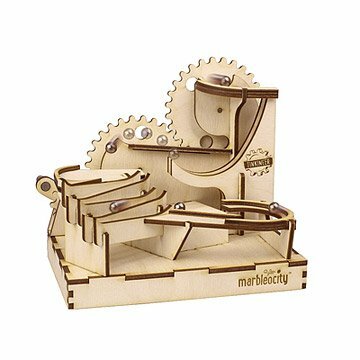 Kids age 9 and up will have a blast building this hand-cranked marvel, where marbles launch off of ramps, zigzag through halfpipes and careen around corners. They might not even realize they're learning principles of physics and mechanics. The instructions take the form of a comic in which a group of young tinkerers and engineers (or "Tinkineers") grapple with a design challenge, and the child then gets to apply the principles they illustrate by building their own, working marble skate park. Once they've assembled the kit, they'll have both newfound knowledge and an impressive, kinetic work of art that they'll be proud to keep on display. Designed by Adam Hocherman; made in Beverly, Massachusetts. Entrepreneur and product designer Adam Hocherman is an unsung hero to parents of toddlers. One of his most beloved products is a clock and night light that helps kids stay in bed longer so parents can get some sleep. He began designing housewares, but ultimately specialized in electronic toys, clocks, and night lights. Today, he's focused on a unique venture that introduces STEM (Science, Technology, Engineering, and Math) concepts to children and adults using natural wood, American-made marble machine kits. Adam lives North of Boston with his wife and two little daughters (who are both headed for careers in engineering). In his rare moments of down time, he enjoys tinkering with his vintage Williams Cyclone pinball machine. Build time is approximately 1 hour. Requires white glue. Fun product overall. When they say it's good for ages 9+ I'd say 9-12 is the right age. The perfect gift for our skateboard loving son! Can't wait for Andrew to open this on his birthday! This item was a gift for my nephew'sâ€‹ 13th birthday. He is a really fun, smart, creative kid, so I thought he might enjoy a bit of challenge assembling this and playing with it, plus displaying in his room as a cool you. Having recently become a wooden model enthusiast, I was excited to find this kit designed by someone from my home state of MA. I've previously built models/kinetic sculptures from other companies with similar laser-cut pieces. Two required no glue, one required glue and included it in the kit (along with a small emery board for sanding). I was disappointed to learn that thus kit required glue and did not include it. The only mention on the packaging to "BYOG" is on the back. I had glue, so I read through the instructions first and went to lay out all my pieces to ensure everything was in good shape...but the pieces weren't labeled. Instead, in every page of instructions, letters were repeated to indicate which pieces I was to add. Most pieces were unique, but especially in later pictures, it became difficult to view which piece to add where, and in what orientation to place them . The thin safety rails were particularly challenging, and there were no alignment marks on the pieces to which they had to be glued to ensure correct layout. Once I had evrything assembled properly, it worked very well. The model, once dry, was quite stable and the included marbles travelled well. Overall, this is a good build project, but could benefit from some more explicit instructions (and less comic book). I would highly recommend that you dry fit the model as entirely as possible before gluing. Make sure you have white glue and a small file. I was impressed by the quality of this item. There were maybe one or two bits in the instructions that weren't immediately clear, but otherwise the project was fun to put together with my teenage son and the final project is something he enjoys. Most of the pieces need to be punched out of a single sheet of wood and I would recommend an X-acto blade to help separate some of the pieces (we only had one issue with a piece not coming cleanly from the sheet and we were able to glue it back together, but the whole process would have been easier with a knife). Overall I was very pleased with this product. It is compact to ship and leads to interesting conversations.